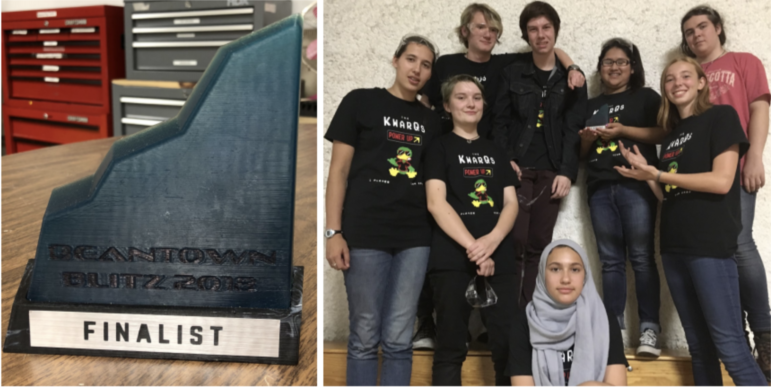 The Watertown High School Robotics Team got second place in the recent Beantown Blitz. On Oct. 6, the Watertown High School Robotics Team competed in Beantown Blitz in Revere where after a long day of competition they were able to advance to the final match and achieve a second place alliance finish in a closely contested final! Seventeen teams from around the New England region attended the competition and joined in three team alliances against other alliances to score points with their robots by strategically and efficiently placing game cubes in Exchanges, Switches and Scales. After competing in nine qualifying matches, the team moved on to the elimination matches. In the semi­final match, the WHS Robotics team’s alliance handily won the round 2­0 in a best of three. The final round was tense as the team’s alliance lost the first match but altered their strategy and won the second match, forcing a third, winner­-take-­all match. The final match started with both teams trading the lead, until the two other teams on the alliance with WHS both had fatal mechanical issues. WHS Robotics was the “last robot standing” on its side and made a valiant effort to rack up points. But the insurmountable numbers advantage resulted in the loss of the final match, leaving the WHS alliance with second place for the day. Team members and supporters were thrilled with the team’s performance and look forward to coming home with a championship in future competitions. Bestselling author Susan Orlean, right, poses with a fan after she spoke at the Watertown Free Public Library on Thursday. For writer Susan Orlean, trips to her hometown library in Shaker Heights, Ohio, had been a childhood ritual, a way of bonding with her mother as they collected armfuls of books to read and discussed their borrowed treasures on the ride home. Editor: Matt Shuman, Watertown’s Town Engineer, was honored at the Charles River Watershed Association’s annual meeting last week. He received their Rita Barron Public Official Award for his efforts with the Edenfield Avenue Green Street project.